Marie King was the backbone of the Museum. 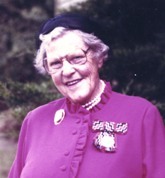 She was involved in setting down Russell's history for over 40 years and during that time was a nationally acknowledged authority, a local historian frequently consulted by others when their work touched upon areas connected with the Bay of Islands. Her books include Port in the North and A Most Noble Anchorage, which is one of the most comprehensive accounts of events, people and places in the Bay of Islands. To preserve the history and heritage of Russell / Kororareka and environs. Ngā taonga tuku iho nō ngā tūpuna ki ā tātou tamariki. The function of the museum is to collect and preserve, exhibit and interpret, and to undertake research on people and events in Russell's history.